In recent years, the number of Information Technology (IT) Industries in India has increased exponentially and this sector has seen considerable economic growth. The proportion of young people working in IT industries is rising rapidly. In addition to sedentary work style, IT employees are also exposed to unhealthy eating habits and high stress levels. This has significant public health implications for future as the burden of cardiometabolic disease may affect young and economically productive age groups. Previously it has been shown that there is high burden of cardiometabolic risk factors among industrial populations across India  but there is no specific data on the employees of IT industry. We therefore decided to assess the prevalence and distribution of cardiometabolic risk factors in IT employees. We approached two IT industries in Pune where voluntary health checks were conducted annually. We contacted the managements of the respective industries and obtained health check data for the year 2011-2012. This was the preliminary phase of our proposed prevention program targeting IT industry employees. The study was approved by the Ethics Committee of the KEM Hospital Research Center, Pune. "Risk factor clustering" was defined as the presence of ≥two risk factors from the 6 cardiometabolic risk factors. We assessed the distribution of risk factor clustering across categories of age and gender. Statistical Package for Social Sciences for windows (SPSS, Chicago III) (SPSS-Inc., Chicago, IL), version 16 was used for analysis. Of 5,800 employees in two IT industries, 1,350 (23%) (78% men) participated voluntarily in the annual health checks offered by the employers. The mean age of the employees was 33 ± 6 years; the majority (72%) were between 30 and 40 years of age. Mean weight of the employees was 70.3 ± 11.7 kg and mean height was 167.1 ± 8 cm. Twenty (1.5%) employees were underweight, 573 (42.4%) were overweight, and 121 (9%) were obese. The proportions were similar in both genders (P for difference = 0.33). Data on blood tests revealed that one in two (50%) employees were anemic; the prevalence of anemia was greater in women compared to men (71.2% vs 30.4% P < 0.001). Of the total employees, 20 were known to have diabetes and 135 were known to have hypertension. Eleven were newly diagnosed with diabetes and 49 were newly diagnosed with hypertension during the checks. Thus, a total of 31 (2.5%) employees had diabetes and 184 (13.5%) had hypertension. Eleven (~1%) employees suffered from both these conditions. Prevalence of prediabetes (IFG) and borderline-high BP were 6.5% and 20.3%, respectively. Hypertriglyceridemia was seen in 21.0% and a similar proportion (22.1%) of employees had high LDL-cholesterol levels. Low HDL-cholesterol was common amongst these employees (70.1%) ([Figure 1]: Prevalence of cardiometabolic risk factors). Only 6.8% employees did not have any risk factors while one-third (29.7%) had one risk factor. 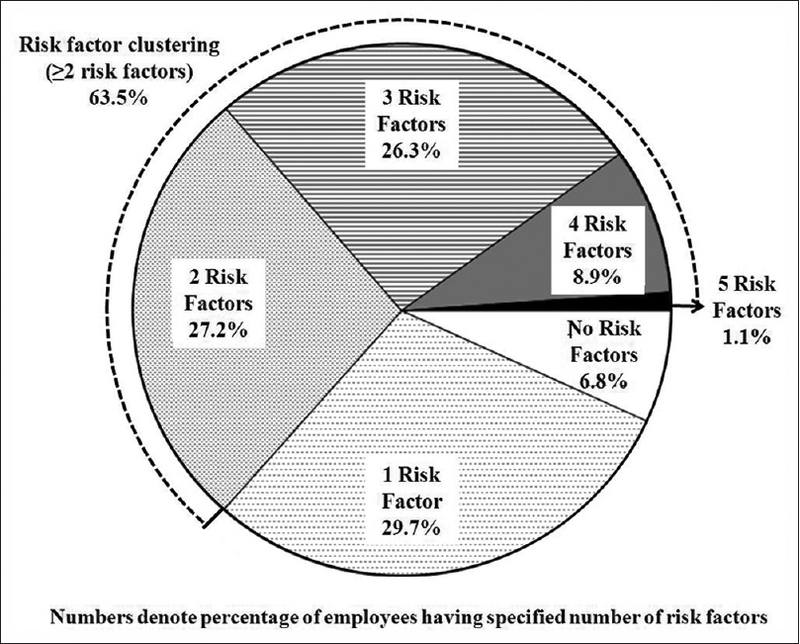 The remaining 63.5% employees had clustering of risk factors (≥two risk factors). Of them, 27.2%, 26.3%, 8.9%, and 1.1% employees had two, three, four, and five risk factors, respectively. ([Figure 2]: Distribution of risk factor clustering). Prevalence of risk factor clustering increased with age (P for trend < 0.001) but was similar in both genders (63.0% in men vs 65.1% in women, P for difference = 0.5). 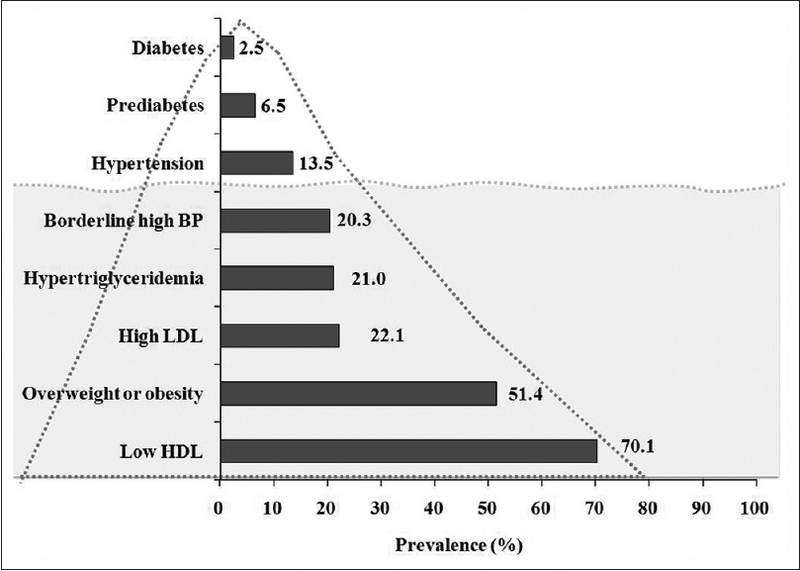 Our study reveals a high prevalence of cardiometabolic risk factors amongst IT employees at a relatively young age in India; 9% had prediabetes or diabetes and 33.8% had borderline high BP or hypertension. Only 6.8% employees had no risk factors while 63.5% had clustering of risk factors. The distribution of disease and risk factors resembles an iceberg [Figure 1] where diseases correspond to the tip (visible portion) and risk factors to the base (vast invisible portion). The base (risk factors) remains unnoticed and often undiagnosed due to lack of any obvious signs and symptoms. Less than a quarter (23.3%) of the employees participated in the free annual health checks offered by employers suggesting that there is considerable lack of awareness and negligence about health in these young professionals. Moreover, one-third of those who had diabetes or hypertension were unaware of the condition. Our findings underline the importance of raising awareness, conducting regular health screenings and designing interventions to reduce the burden of risk factors before cardiometabolic diseases appear. When compared with the only study available on an Indian industrial population,  it was evident that the prevalence of diabetes and hypertension was more than double (10.1 vs 2.5% and 27.7 vs 13.5%, respectively) in that study. These differences may possibly be due to the older age of those participants compared to our study population (mean age 40 ± 6 years vs 33 ± 6 years). The study population in the previous survey was heterogeneous as both employees and their family members were included. It is interesting to note that despite these differences the prevalence of overweight and obesity was similar (51%) in our study participants. It is possible that these employees are at greater risk due to a higher BMI at a younger age. Though our survey is an opportunistic analysis and information on parameters such as education, socioeconomic status, family history, abdominal obesity (waist circumference), and lifestyle factors such as dietary intake and physical activity is not available, the group we studied is relatively homogenous. The employees of IT industry are qualified professionals who are well paid and exposed to a similar work environment. We obtained records anonymously and ensured the data available from the two industries were comparable. To our knowledge, this is the first study to establish the prevalence of cardiometabolic risk factors in employees of IT industry in India. The high burden of risk factors at a relatively young age is suggestive of an urgent need to spread awareness among IT employees and encourage them to take up health checks offered through workplaces. Workplace intervention programs to promote healthy lifestyle have proven to be effective. A technology-based intervention (use of internet or mobile phone technologies) may form an alternative strategy and a cost-effective option to labor-intensive interventions attempted previously. It may also be an acceptable approach considering the technology literacy of these employees. Based on these factors, we are delivering a technology-based lifestyle modification intervention in IT employees to test its acceptability and effectiveness. Such programs may improve the health profile of the workforce, and in the longer term improve work productivity and benefit both employees and employers. We are grateful for the support provided by Diabetes Unit-KEM Hospital, Pune. We thank the administrators of IT industries who made the health records available for this analysis. Department of Science and Technology (DST), New Delhi. World Health Organization. Global Status Report on Noncommunicable Diseases 2010. Geneva, Switzerland: World Health Organization; 2011. p. 162. Mayer-Davis EJ, Costacou T. Obesity and sedentary lifestyle: Modifiable risk factors for prevention of type 2 diabetes. Curr Diab Rep 2001;1:170-6. India Brand Equity Foundation. India: IT Industry in India, Inc.; c2010-15 [updated 2015 February]. Available from: http://www.ibef.org/industry/information-technology-india.aspx. [Last accessed on 2015 Mar 01]. Bhatnagar S. India′s software industry. In: Chandra V, editor. Technology, Adaptation, and Exports: How some Developing Countries got it Right. Washington DC: World Bank; 2006. p. 95-124. Guardian News and Media Limited. India: Lifestyle′ diseases hit India′s IT workers Inc.; c2015 [updated 2007 September]. Available from: http://www.theguardian.com/world/2007/sep/14/business.india. [Last accessed on 2015 Mar 01]. American Diabetes Association. Standards of medical care in diabetes-2013. Diabetes Care 2013;36(Suppl 1):S11-66. Chobanian AV, Bakris GL, Black HR, Cushman WC, Green LA, Izzo JL, et al. ; Joint National Committee on Prevention, Detection, Evaluation, and Treatment of High Blood Pressure. National Heart, Lung, and Blood Institute; National High Blood Pressure Education Program Coordinating Committee. Seventh report of the joint national committee on prevention, detection, evaluation, and treatment of high blood pressure. Hypertension 2003;42:1206-52. Alberti KG, Zimmet P, Shaw J. Metabolic syndrome - A new worldwide definition. A consensus statement from the international diabetes federation. Diabet Med 2006;23:469-80. World Health Organization. Haemoglobin concentrations for the diagnosis of anaemia and assessment of severity. Geneva: World Health Organization; 2011. p. 1-6. Prabhakaran D, Jeemon P, Goenka S, Lakshmy R, Thankappan KR, Ahmed F, et al. Impact of a worksite intervention program on cardiovascular risk factors: A demonstration project in an Indian industrial population. J Am Coll Cardiol 2009;53:1718-28.